It’s the year 2046 when the Wave Rider makes its landing in this week’s new episode of DC’s Legends of Tomorrow — and a very different Star City. 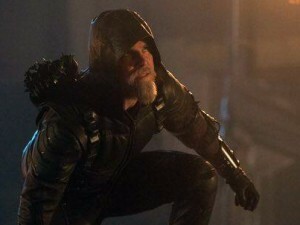 Stephen Amell (Arrow) guest stars in this week’s episode as Oliver Queen, but he’s not the only Green Arrow in the future. The team will also meet Connor Hawke (Joseph David-Jones, Allegiant), a major character from the comics, who has taken on the Green Arrow mantle in the future. Also this week: Mulder is missing when The X-Files 6-episode event series reaches its final hour tonight, with appearances from Annabeth Gish (“Monica Reyes”), The Flash‘s Robbie Amell (“Agent Miller”), and Six Feet Under‘s Lauren Ambrose (“Agent Einstein”). It’s been a very fun revival, and while there are no plans yet announced by Chris Carter and FOX, hopefully there will be more X-Files for us in the future. 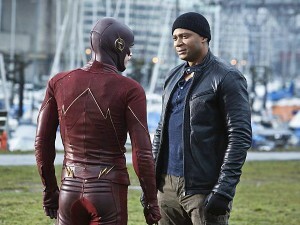 Arrow‘s Diggle and Lyla pay a visit to Central City to hunt down King Shark on this week’s episode of The Flash, while DC super-heroine Vixen (Megalyn Echikunwoke, pictured left) makes her live-action debut on Arrow. Agent Carter has another episode double-header on Tuesday, and Jenny digs up family skeletons when she confronts her father on Sleepy Hollow. “Truth, Justice and the American Way.” Supergirl does battle with the deadly Master Jailer, who is hunting and executing escaped Fort Rozz prisoners. Also, Cat hires a second assistant, Siobhan Smythe, who immediately tries to one-up Kara, and Kara and James disagree over the DEO’s methods. “My Struggle II.” The season concludes with people all across the country falling gravely ill. A widespread panic develops and Scully looks within to find a cure. Meanwhile, Mulder confronts the man he believes to be behind it all, but another figure from Mulder and Scully’s past may prove to be the key to their salvation. “King Shark.” When King Shark escapes from an A.R.G.U.S. 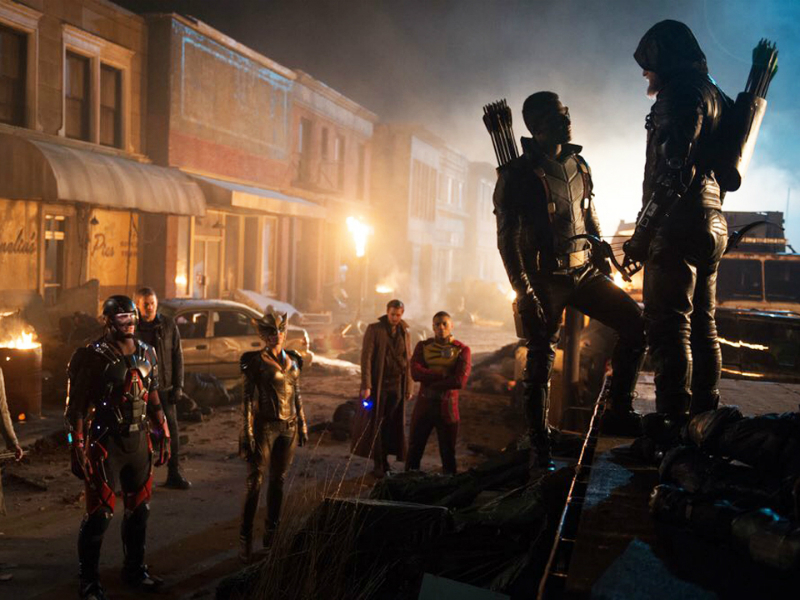 holding tank, Lila and Diggle travel to Central City to warn The Flash. King Shark shows up at the West house and attacks Joe, Iris, Wally and Barry. “The Edge of Mystery.” Peggy and Sousa propose a trade with Whitney Frost, while the SSR gets help from Howard Stark that may be the key to eliminating Zero Matter. “A Little Song and Dance.” Peggy desperately tries to save Dr. Wilkes with a dangerous plan to stop Whitney Frost. But Thompson makes a surprising move that could destroy them all. 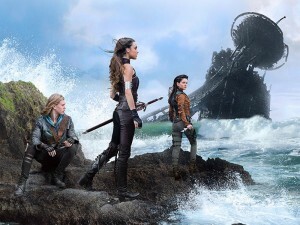 “Safehold.” Wil, Amberle and Eretria cross ancient human ruins to reach the Bloodfire, but an evil tests their friendship and manipulates them to turn on each other. “Taken.” Oliver realizes he needs help battling Darhk so he calls in an old friend — Vixen. 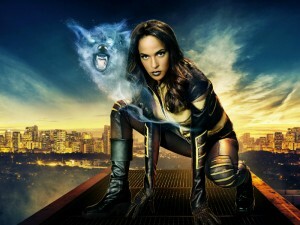 Using her magical ability to summon animal powers, Vixen gets a lock on Darhk’s location and the team goes to war. Meanwhile, Thea has a heart-to-heart talk with Malcolm. “Star City 2046.” When a malfunction sends the Waverider crashing into 2046 Star City, our heroes face a startling version of their own future where they never stop Savage and never return home. The city is in ruins and overrun by criminals, which thrills Rory. Sara is despondent over the destruction of her home and stunned when she learns what happened to her old friend, Oliver Queen. 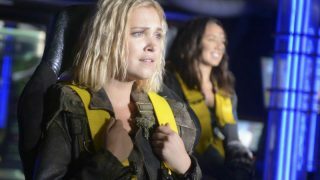 “Bitter Harvest.” Clarke is torn between vengeance and mercy. 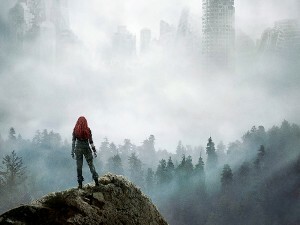 Meanwhile, Kane and Octavia work together to avert a disaster, and Abby continues to worry about Raven. “Sins of the Father.” When Jenny makes the decision to confront her father, family turmoil from the past rises to the surface. Meanwhile, Atticus Nevins returns to town, bringing more danger than the FBI could have imagined. GRIMM returns with a new episode next week.